Lucas Richman, has served as Music Director and Conductor for the Bangor Symphony Orchestra since 2010 and was Music Director for the Knoxville Symphony Orchestra from 2003 to 2015. His command of the core repertoire, coupled with his finesse in presenting new and contemporary works, continues to illustrate Mr. Richman as a source of musical expertise and artistic excellence. The Bangor Daily News recently wrote, “The BSO sounded stronger and more confident than it has in years… since a strong musical leader has arrived to give shape and focus to the orchestra. 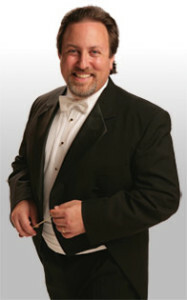 As an audience member commented as people filed out of the CCA — when was the last time you heard the Bangor Symphony Orchestra sound so happy?” Mr. Richman received a GRAMMY Award (2011) for having conducted the Royal Philharmonic Orchestra on Christopher Tin’s classical/world fusion album Calling All Dawns in the category of Best Classical Crossover Album. He has appeared as guest conductor with numerous orchestras including the New York Philharmonic, Los Angeles Philharmonic, Baltimore Symphony, Delaware Symphony, Indianapolis Symphony, New Jersey Symphony, Canada’s National Arts Centre Orchestra, the SWR Radio Orchestra of Kaiserslautern (Germany), the Tiroler Kammerorchester InnStrumenti (Austria) and the Zagreb Philharmonic (Croatia). Mr. Richman served as Assistant and Resident Conductor for Mariss Jansons and the Pittsburgh Symphony Orchestra between 1998-2004 and, from 1988 to 1991, he was the Assistant Conductor for the Pacific Symphony Orchestra. In recent years, he has collaborated with notable soloists such as Mstislav Rostropovich, Garrick Ohlsson, Lang Lang, Midori, Gil Shaham, Emanuel Ax, Yefim Bronfman, Frank Peter Zimmerman, Mark O’Connor, Andre Watts and Radu Lupu. Mr. Richman earned a Master of Music degree in orchestral conducting from the University of Southern California, where he was a student of Daniel Lewis. He studied privately with Fritz Zweig and Victor Yampolsky, and was also selected as a conducting fellow in master classes with Pierre Boulez, André Previn, Herbert Blomstedt and Kurt Sanderling. Earlier in his musical journey, he toured with West Germany’s Schleswig-Holstein Musik Festival Orchestra, for which he was one of four conductors from around the world selected by Leonard Bernstein to share the maestro’s podium for concerts presented in London and Moscow. Over the past decade, Mr. Richman collaborated with numerous film composers as their conductor, recording scores for such films as the Academy Award-nominated The Village (with violinist, Hilary Hahn), As Good As It Gets, Face/Off, Se7en, Breakdown, The Manchurian Candidate and Kit Kittredge: An American Girl. Most recently, John Williams personally invited Mr. Richman to serve as the conductor for the three-month national summer tour of Star Wars in Concert. An accomplished composer, Mr. Richman has had his music performed by over two hundred orchestras in the last fifteen years. In November, 2009, as the result of an NEA commission, the San Diego Symphony Orchestra premiered his Behold the Bold Umbrellaphant, a setting of poetry by Children’s Poet Laureate, Jack Prelutsky, which Jahja Ling and the SDSO recorded for release in December, 2011. Commissioned by the Pittsburgh Symphony, his Concerto for Oboe was premiered in February 2006 (Cynthia DeAlmeida, oboe; Sir Andrew Davis, conductor), while the Knoxville Symphony presented his Concerto for Percussion in March 2006 (Timothy Adams, percussion). Mr. Richman’s choral work, Arise Triumphant, O Blessed Muse!, was premiered in January, 2005, with Frederica von Stade as the soloist. Recordings of Mr. Richman’s music also include those featuring Giora Feidman (Variations for Clarinet and Cello), the Tiroler Kammerorchester InnStrumenti of Innsbruck (The Seven Circles of Life) and his song for breast-cancer awareness, We Share A Bond, which, created in collaboration with Komen Knoxville, features a choir of survivors and co-survivors singing with the Knoxville Symphony. Mr. Richman is a respected leader in the field of planning and conducting concerts for young people, having done so for over twenty years with various orchestras across the United States. His works written specifically for children have been featured in young people’s concerts presented by numerous orchestras including the Atlanta Symphony, Houston Symphony, Grand Rapids Symphony and the San Antonio Symphony. Taking children’s concert programming and musical education to new heights for the next generation, Mr. Richman is responsible for the creation of an animated guide to classical music, which is featured in full symphonic concerts. The character, Picardy Penguin®, is entering its seventh year of performances with orchestras, both at home in Knoxville and around the US. Another top-seller is the album, Day is Done, a collection of original and traditional lullabies composed and arranged by Mr. Richman as an aid for parents wishing to introduce their children to the joys of music. The CD, a companion children’s book and a listing of Mr. Richman’s compositions can be found through LeDor Group, Inc. at www.ledorgroup.com.